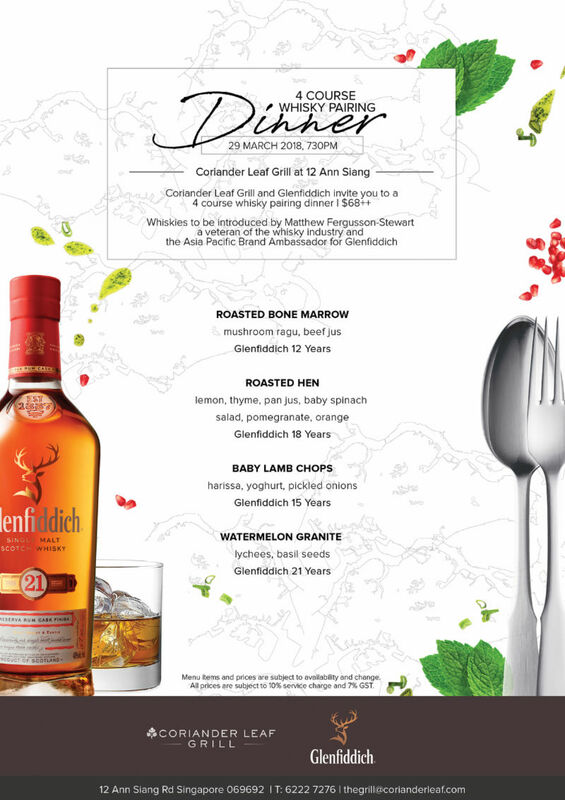 Coriander Leaf Grill will be hosting a special whisky pairing dinner on Thursday 29 March 2018 at 7.30pm featuring the whiskies of single malt Scotch whisky brand Glenfiddich. Glenfiddich is of course the world’s most awarded single malt whisky, and Glenfiddich’s award-winning regional brand ambassador for Asia Pacific Matthew Fergusson-Stewart will be on hand to introduce the whiskies for the pairing dinner. Full menu and pairing details given below. This event costs $68++; to book a spot call 6222 7276 or email thegrill@corianderleaf.com.